Ha! I managed to get a photo of Sterling with his creation with his new wood burner. We spent the majority of the day at the zoo, seeing, for the first time in a very long time, perhaps ever, every single zoo creature. It was fun. And I’m exhausted. And now a poll: how on earth do you teach children to focus and follow through?! I have a few that are running me ragged and still we figure nothing out. I know there has to be a clever way to teach this lesson so it sticks…. Better than the way my feet stick to the floor that some dear child got sidetracked half way through sweeping and mopping and left it covered in sticky crud. ← Sterling turns eight and other pieces of our day. I make a list. They can cross it off when they’re done. Seems to be doing ok.
Good job on the picture Sterling. 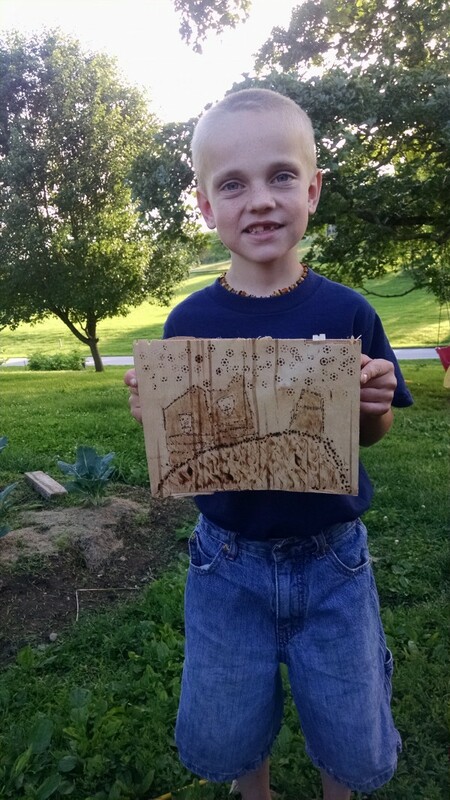 You just might be an artist at wood burning. Love the wood burner gift! And what a good job he’s doing. Looks like fun!